So happy to be back for one last round of Shop the House! If you haven’t been following along, myself and five other bloggers have been shopping our homes for the last few months and changing one space in the house. I have re-decorated my office each time, and it’s been so much fun! For this last round, I wanted to keep it simple. 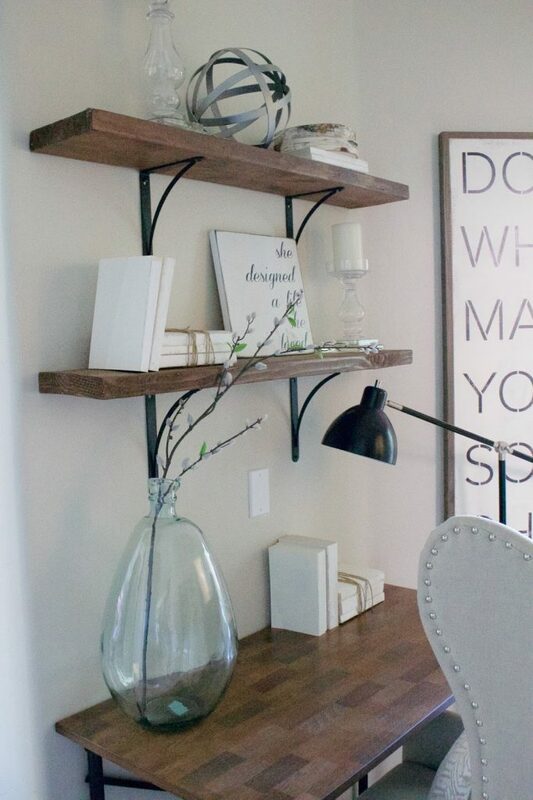 Again, I’ve been craving such simplicity in our home lately it has really taken over in almost every space. I kept my bundled books, brought in my Target vase from the dining room, used some old candlesticks & an old metal orb. My friend Dawn at Eventually Cottage made a sign for me inspired by Joanna Gaines that I’ve seen on HGTVs Fixer Upper. No truer words than designing a life a that you love. I think this might be one of my favorite set ups yet! I love the simplicity of this decor. I have HUGE plans to update this space in a few weeks that I will be sharing soon. Can’t wait!This little Shop the House Challenge was so fun and we each got to decorate a space in our home four different ways for FREE! Shopping the house is a great tool to use to update and re-decorate your space. Sometimes, it as easy as updating shelving or switching out toss pillows. Like this post? Pin it and save it for later! This challenge was so much fun and I actually would like to continue in the rest of our home. 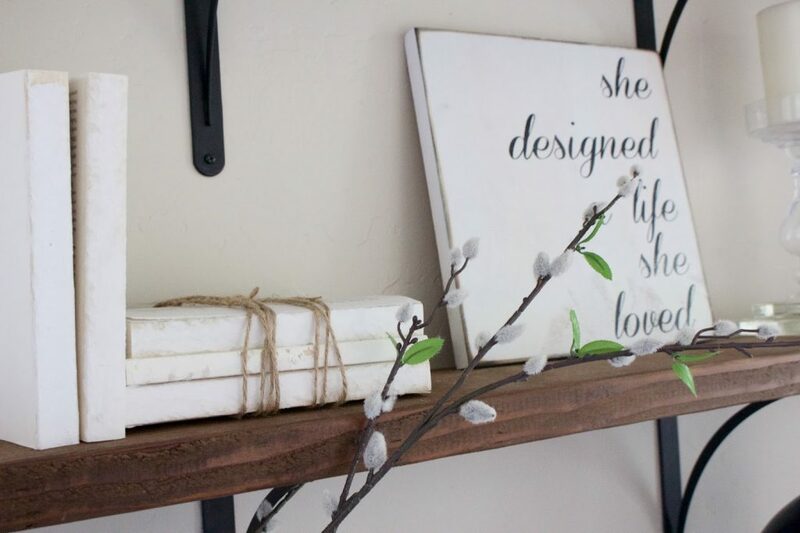 Shopping the house is the best way to freshen up a space! Soon, I will be sharing my plans for updating my little office space. Can’t wait! I love the shelves! 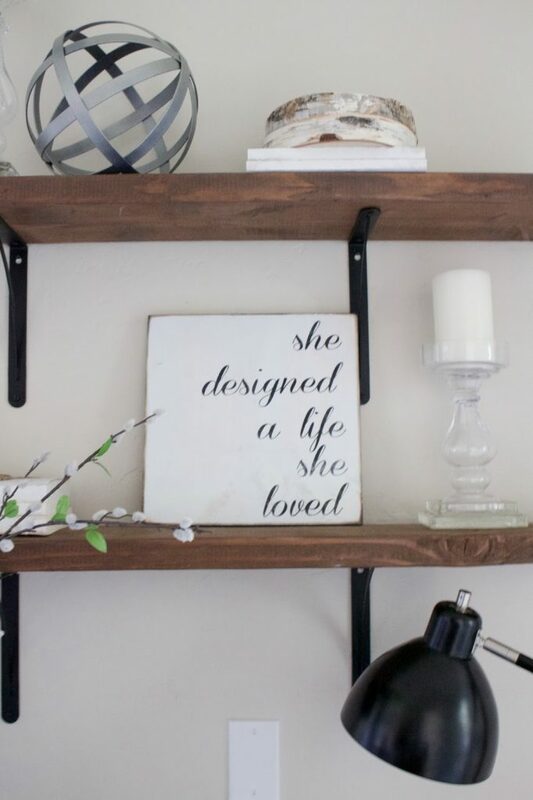 Where did you find the shelf brackets? I have been looking for some similar to these. I just love all of the different style Allison! So pretty! Thanks Iris! I was pretty shocked when I see them all together, its amazing how much my style has changed in four months, haha!